Developing a Scalable Predictive-Maintenance Architecture Executive Overview To gain and maintain a competitive advantage in today’s world, manufacturers from all industries are turning to Industrial Internet of Things (IIoT) technology. IIoT can help identify excursions1 in standard processes, prevent unscheduled downtime due to tool failure, decrease overall maintenance costs, and improve productivity. But implementing IIoT solutions can be challenging. In early pilots, we reduced unscheduled downtime due to fan filter unit (FFU) failure by 300 percent over manual inspection. Excursions indicate undesired changes in the manufacturing process that result in significant damage to materials. Results based on Intel internal testing. Results based on Intel internal testing. Background Intel’s factories are some of the most advanced in the world, with thousands of process and automation clients on the factory floor, hundreds of analytics servers in the data center, and hundreds of thousands of feet of fiber for transmitting data. Manufacturing semiconductors entails a degree of precision that not every factory requires. But all modern manufacturers can benefit from better understanding the health of their tools and processes. Industrial Internet of Things (IIoT) solutions can help overcome these common problems: • Excursion. An excursion in the manufacturing process, due to failing tool components, can impact yield and forecasting, making it more difficult for the factory to meet goals and objectives. • Unscheduled downtime. Without visibility into the health of all parts of a tool, it is difficult to predict maintenance needs, resulting in unscheduled downtime and less productive workers. • Higher cost of maintenance. When tools unexpectedly fail, in addition to the loss of productivity, repair costs increase due to expediting parts and the impact of secondary failure modes. • Labor-intensive processes. Relying on the labor-intensive process of having humans visually check tool health can be costly over time. In the past, technicians placed a hand on the fan to determine if it was spinning differently from the previous day. The lack of data made it difficult to identify anomalies and increases the risk of error. Implementing IIoT solutions can be challenging. Intel has been using IIoT for years, for a variety of processes, but we needed a new process to monitor the health of our fan filter units (FFUs)—which are ubiquitous in the factory (see Figure 1)—to better understand trends and predict failure. We also wanted to maintain a high degree of security and move analytics to the edge to reduce the amount of data transmitted across the network. We partnered with GE Digital to co-develop a highly scalable solution using Intel® Internet of Things (Intel® IoT) Gateways and GE’s Predix* platform. Solution At Intel, we have learned the importance of connecting the unconnected to enable data generation and collection, driving edge analytics to deliver real-time insights, and using IIoT and artificial intelligence (AI) solutions to push filtered data to the cloud. 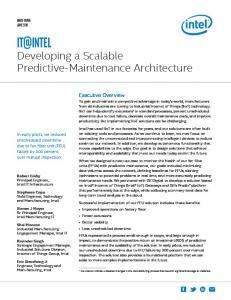 Intel IT selected FFUs as an excellent use case for predictive-maintenance IIoT using edge-to-cloud technologies to store manufacturing data off-premises. FFUs represent a single process that is small enough in scope, yet large enough in impact, to demonstrate return on investment (ROI) in the factory. We used Intel IoT Gateways with GE’s Predix platform to achieve this. Our goals included the following: • Edge processing. We implemented edge analytics to limit the amount of data transmitted across the network and to the cloud. • Reporting. We needed to identify the long-term behavior and trends of each FFU through traditional reporting—statistics, graphs, and charts— based on summary data. Essentially, our data collection and research needed to provide fan vibration fingerprints in various states for analyzing changes. Results based on Intel internal testing. Figure 2. We installed sensors on each fan filter unit (FFU) to measure vibration and transmit that data to the edge application. We then employed an edge architecture compatible with running machine-learning algorithms to generate real-time alerts based on inconsistencies and potential problems. Defining Measurable Success Criteria With any Industrial Internet of Things (IIoT) solution, defining measurable success criteria is critical. For fan filter units (FFUs), we used the following to evaluate the overall success of the implementation: • Hard failure. Our goal was to detect 100 percent of hard failures within five minutes of failure, while minimizing false positives. • Soft failure. Our goal was to detect 80 percent of potentially faulty fans that had not yet failed (soft failures) within 24 hours, while minimizing false positives. • Baseline. We defined a baseline—or fingerprint—of a healthy FFU that could be used in detecting hard and soft failures. • Sensors. The solution needed to support up to 10 accelerometers per tool with a sampling frequency of 1 kHz (1,000 data points per second). • Scalability. The solution needed to scale to hundreds of tools with thousands of sensors without impacting our infrastructure, such as overloading the network with data transmissions. • Compatibility. Our user interface for data extraction and analysis had to be compatible with approved mobile devices for integration with current factory operations. • Edge processing. The solution needed to analyze data at the edge and single out only signals that predict failure before sending them to the cloud. Architecture Intel® technology allows us to reuse existing software and connect tools that may or may not have been designed for IIoT. The open, interoperable platform works with our existing data center software, and enables performance at the edge at a lower cost. Using Intel IoT Gateways and GE’s Predix platform (see Figure 3), the FFU solution offers the following: • Scalability. Standardized data structures, reduced bandwidth requirements, and cloud storage provide excellent scalability to multiple FFUs and other manufacturing processes. • Security. Our high-security solution allows us to protect the data, both in the factory as well as the cloud. Cloud-based platform as a service (PaaS) security decisions require a thorough vetting of over 100 security data management policies. • Performance at the edge. The Intel Atom® processor E3800 product family—systemon-chip (SoC)—delivers outstanding compute, graphical, and media performance while operating in an extended range of thermal conditions compared with previousgeneration Intel Atom® microarchitecture.5 • Interoperability. Using the Message Queuing Telemetry Transport (MQTT) lightweight connectivity protocol, we can connect power-constrained devices. Designed for lowbandwidth networks, it allows smooth connection between devices to the cloud. • Open platform. Open source embedded products allow us to use the latest code and the most recent technologies. Figure 3. Intel® Internet of Things (Intel® IoT) Gateways and GE’s Predix* platform solution provide scalability, security, interoperability, and performance at the edge. The scalable, interoperable framework we developed for the FFU process creates a foundation that can be used in a variety of other IIoT use cases in the factory. For example, we plan to scale this solution to include detecting anomalies in electro-mechanical devices and other manufacturing processes. Additionally, Intel is now partnering with GE to work with OEMs and suppliers to learn how a partnership approach, along with external domain expertise, can further enhance the value of this IIoT solution across Intel’s supply chain. We connect IT professionals with their IT peers inside Intel. Our IT department solves some of today’s most demanding and complex technology issues, and we want to share these lessons directly with our fellow IT professionals in an open peer-to-peer forum. Our goal is simple: improve efficiency throughout the organization and enhance the business value of IT investments. As Intel looks to scale globally, we will explore leveraging Predix* Asset Performance Management (Predix* APM) solutions to centrally view and manage our tools and assets. Visit us today at intel.com/IT or contact your local Intel representative if you would like to learn more. When Intel created a new use case to monitor the FFUs and better predict health trends before failure, we needed a solution that maintains a high degree of security, performs analytics at the edge, and minimizes the amount of data transmitted across the network. We were able to achieve these goals by using Intel IoT Gateways and GE’s Predix platform. Selecting FFUs as our first cloud-based predictive-maintenance solution also allowed us to demonstrate ROI with a single, ubiquitous process. Through data standardization, partnering with industry experts, and setting measurable goals, our FFU IIoT solution has allowed us to develop a foundation for edge-to-cloud IIoT computing that can scale to other processes and tools in the factory. This new solution has helped us experience a 300 percent decrease in unscheduled downtime over manual FFU monitoring, improving productivity and optimizing operations. For more information on Intel IT best practices, visit intel.com/IT. For more information about the partnership with GE, visit intel.com/GE. Software and workloads used in performance tests may have been optimized for performance only on Intel microprocessors. Performance tests, such as SYSmark and MobileMark, are measured using specific computer systems, components, software, operations and functions. Any change to any of those factors may cause the results to vary. You should consult other information and performance tests to assist you in fully evaluating your contemplated purchases, including the performance of that product when combined with other products. For more information go to www.intel.com/benchmarks. Benchmark results were obtained prior to implementation of recent software patches and firmware updates intended to address exploits referred to as “Spectre” and “Meltdown”. Implementation of these updates may make these results inapplicable to your device or system. All information provided here is subject to change without notice. Contact your Intel representative to obtain the latest Intel product specifications and roadmaps. Cost reduction scenarios described are intended as examples of how a given Intel-based product, in the specified circumstances and configurations, may affect future costs and provide cost savings. Circumstances will vary. Intel does not guarantee any costs or cost reduction. Intel processor numbers are not a measure of performance. Processor numbers differentiate features within each processor family, not across different processor families: Learn About Intel® Processor Numbers. THE INFORMATION PROVIDED IN THIS PAPER IS INTENDED TO BE GENERAL IN NATURE AND IS NOT SPECIFIC GUIDANCE. RECOMMENDATIONS (INCLUDING POTENTIAL COST SAVINGS) ARE BASED UPON INTEL’S EXPERIENCE AND ARE ESTIMATES ONLY. INTEL DOES NOT GUARANTEE OR WARRANT OTHERS WILL OBTAIN SIMILAR RESULTS. INFORMATION IN THIS DOCUMENT IS PROVIDED IN CONNECTION WITH INTEL PRODUCTS AND SERVICES. NO LICENSE, EXPRESS OR IMPLIED, BY ESTOPPEL OR OTHERWISE, TO ANY INTELLECTUAL PROPERTY RIGHTS IS GRANTED BY THIS DOCUMENT. EXCEPT AS PROVIDED IN INTEL’S TERMS AND CONDITIONS OF SALE FOR SUCH PRODUCTS, INTEL ASSUMES NO LIABILITY WHATSOEVER AND INTEL DISCLAIMS ANY EXPRESS OR IMPLIED WARRANTY, RELATING TO SALE AND/OR USE OF INTEL PRODUCTS AND SERVICES INCLUDING LIABILITY OR WARRANTIES RELATING TO FITNESS FOR A PARTICULAR PURPOSE, MERCHANTABILITY, OR INFRINGEMENT OF ANY PATENT, COPYRIGHT OR OTHER INTELLECTUAL PROPERTY RIGHT. No license (express or implied, by estoppel or otherwise) to any intellectual property rights is granted by this document. Intel, the Intel logo, and Intel Atom are trademarks of Intel Corporation in the U.S. and other countries. *Other names and brands may be claimed as the property of others. downtime due to tool failure, decrease overall maintenance costs, and improve productivity. ... data volumes across the network, defining baselines for FFUs, alerting ... our unscheduled downtime due to FFU failure by 300 percent over manual .... each FFU through traditional reportingâstatistics, graphs, and chartsâ. Oct 2, 2017 - decentralized networks. He is an entrepreneur, visionary, guru, author, blogger, keynote speaker, and thought leader of the global technology. FINALLY, THE MAIN FEATS OF THE JADE APPROACH ARE SUMMED UP, WITH .... ster or Gnutella) or a multiplayer game, require ... of another user: the server is not necessary but it is .... an agent platform and a set of services that should. market. This overview paper outlines in detail the concept and planning behind Electroneum ... listed on the London Stock Exchange, Mark .... 3G or 4G data. development and use of web services for a broad scope of multimedia .... computational cloud, such as the Amazon Elastic Compute Cloud (EC2) (Amazon Web ... The service provider is interested in efficient services in that the response time. Jan 7, 2005 - The best tilt angle for any PV array is the one ... Triple-Junction, amorphous silicon PV array would be .... Insolation level (W/m2) or (Whr/m2). of CPU cores, while maintaining a high performance-to- power ratio, which is the key metric if hardware is to con- tinue to scale to meet the expected demand of ExaScale computing and Cloud growth. In contrast to the KVM Hypervisor platform, the Xen. from eBay to Visa, and Salesforce.com to Apple. ... scalabilityâand achieve unprecedented IT and business performance. ... customer-aligned monitoring. teracts with a MySQL backend database for storage and retrieval of system/user data. ..... This is part of the reason why files in file-sharing peer-to-peer systems. 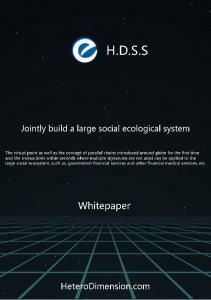 The Lack of Innovation in Wealth Management 2 ... combination of self-learning algorithms, swarm intelligence and smart contracts ... White Paper SwissBorg.pdf.